A 1562 map of the Americas that first employed the name "California." This article covers the history of California through 1845, the eve of the American conquest in 1846. The article tells the story of California from the time that immigrants from Asia began arriving some 13,000 years ago through the exploration of the coasts and inland valleys by European explorers. For later events, see California, history since 1846. For the state today, see California. The circumstances of the arrival of the first humans in California remain a mystery. In all, some 30 tribes (or culture groups) lived in the area of present-day California, gathered into perhaps six different language family groups. These groups included the early-arriving Hokan family (winding up in the mountainous far north and Colorado River basin in the south), and the recently arrived Uto-Aztekan of the desert southeast. This cultural diversity was among the densest in North America, and was likely the result of a series of migrations and invasions during the last 10,000-15,000 years. While the general consensus is that California was populated by people who crossed the Bering Strait from Asia, the details of these groups’ passage and arrival are unknown. The remains of Arlington Springs Man on Santa Rosa Island are among the traces of a very early habitation, dated to the last ice age (Wisconsin glaciation) about 13,000 years ago. At the time of the first European contact, Native American tribes included the Chumash, Maidu, Miwok, Modoc, Mohave, Ohlone, Shasta, and Tongva. Tribes adapted to California’s many climates. Coastal tribes were a major source of trading beads, produced from mussel shells using stone tools. 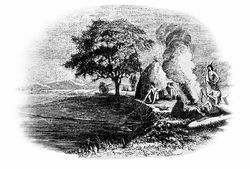 Tribes in California's broad Central Valley and the surrounding foothills developed an early agriculture, burning the grasslands to encourage growth of edible wild plants, especially oak trees. The acorns from these trees were pounded into a powder, and the acidic tannin leached out to make edible flour. Tribes living in the mountains of the north and east relied heavily on salmon and game hunting, and used California’s volcanic legacy by collecting and shaping obsidian for themselves and for trade. The deserts of the southeast were home to tribes who learned to thrive in that harsh environment, by making careful use of local plants and living in oases and along water courses. The status of all these people remained dynamic, as the more successful tribes expanded their territories, and less successful tribes contracted. Slave-trading and war among tribes alternated with periods of relative peace. In all, it is estimated that, by the time of extensive European contact in the 1700s, perhaps 300,000 Native Americans were living within what is now California. A map wherein California is depicted as an island, published circa 1650. Ink and watercolor with pictorial relief. The first European explorers, flying the flags of Spain and of England, sailed along the coast of California from the early 1500s to the mid-1700s, but no European settlements were established. 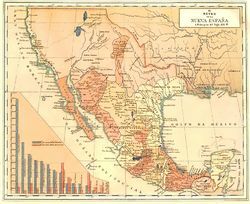 The most important colonial power, Spain, focused attention on its imperial centers in Mexico, Peru, and the Philippines, neglecting California. Confident of Spanish claims to all lands touching the Pacific Ocean (including California), Spain simply sent an occasional exploring party sailing along the California coast. The California seen by these ship-bound explorers was one of hilly grasslands and forests, with few apparent resources or natural ports to attract colonists. The other colonial states of the era, with their interest on more densely populated areas, paid limited attention to this distant part of the world. It was not until the middle of the 1700s, that both Russian and British explorers and fur-traders began encroaching on the margins of the area. About 1530, Nuño Beltrán de Guzmán (President of New Spain) was told by an Indian slave of the Seven Cities of Cibola that had streets paved with gold and silver. About the same time, Hernán Cortés was attracted by stories of a wonderful country far to the northwest, populated by Amazonish women and abounding with gold, pearls, and gems. The Spaniards conjectured that these places may be one and the same. An expedition in 1533 discovered a bay, most likely that of La Paz, before experiencing difficulties and returning. Cortés accompanied expeditions in 1534 and 1535 without finding the sought-after city. On May 3, 1535, Cortés claimed "Santa Cruz Island" (now known as the peninsula of Baja California), and laid out and founded the city that was to become LaPaz later that spring. In July 1539, moved by the renewal of those stories, Cortés sent Francisco de Ulloa out with three small vessels. He made it to the mouth of the Colorado, then sailed around the peninsula as far as Cedros Island. The account of this voyage marks the first recorded application of the name "California". It can be traced to the fifth volume of a chivalric romance, Amadis de Gallia, arranged by Garci Rodríguez de Montalvo and first printed around 1510, in which a character travels through an island called "California". Juan Cabrillo, a Portuguese explorer noted for his exploration of the west coast of North America on behalf of Spain. 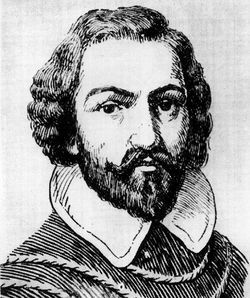 The first European to explore the coast was Juan Rodríguez Cabrillo, a Portuguese navigator sailing for the Spanish Crown. In June, 1542 Cabrillo led an expedition in two ships from the west coast of what is now Mexico. He landed on September 28 at San Diego Bay, claiming what he thought was the Island of California for Spain. Cabrillo and his crew landed on San Miguel, one of the Channel Islands, then continued north in an attempt to discover a supposed coastal route to the mainland of Asia. Cabrillo likely sailed as far north as Pt. Reyes (north of San Francisco), but died as the result of an accident during this voyage; the remainder of the expedition, which likely reached as far north as the Rogue River in today's southern Oregon was led by Bartolomé Ferrelo. On June 7 1579, the English explorer Sir Francis Drake saw an excellent port, which he called Nova Albion and claimed for England. The location remains unknown and there was no follow-up. 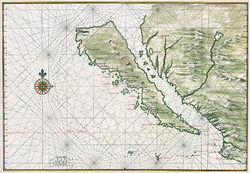 In 1602, the Spaniard Sebastián Vizcaíno explored California's coastline as far north as Monterey Bay, where he put ashore. He ventured inland south along the coast, and recorded a visit to what is likely Carmel Bay. His major contributions to the state's history were the glowing reports of the Monterey area as an anchorage and as land suitable for settlement, as well as the detailed charts he made of the coastal waters (which were used for nearly 200 years). A painted portrait depicting Juan Bautista de Anza, founder of San Francisco, in 1774. In 1775-1776, Anza led more than 240 men, women, and children on an overland journey across the frontier of New Spain to settle Alta California. De Anza was born in Mexico around 1728 and died in Mexico on December 19, 1788. For more information, see: James Cook. British seafaring Captain James Cook, midway through his third and final voyage of exploration in 1778, sailed along the west coast of North America aboard the HMS Resolution, mapping the coast from California all the way to the Bering Strait. In 1786, Jean-François de Galaup, comte de La Pérouse led a group of scientists and artists on a voyage of exploration ordered by King Louis XVI and were welcomed in Monterey. They compiled an account of the Californian mission system, the land and the people. Traders, whalers and scientific missions followed in the next decades. For more information, see: Spanish missions in Baja California. 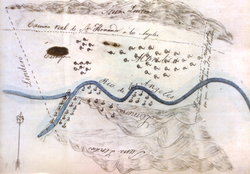 A conceptual drawing of Misión de Nuestra Señora de Loreto, Baja California Sur, circa 1760. In 1697 the Jesuit missionary Juan María de Salvatierra established Misión de Nuestra Señora de Loreto Conchó, the first permanent mission in Baja California Sur. The California territory at this time was part of New Spain, and not divided as it is today. Jesuit control over the peninsula was gradually extended, first in the region around Loreto, then to the south in the Cape region, and finally toward the north across the northern boundary of Baja California Sur. By 1765, 21 missions were established in California. During the last quarter of the 18th century, the first Spanish settlements were established in Alta California. Reacting to interest by Russia and possibly Great Britain in the fur-bearing animals of the Pacific north coast, Spain further extended the series of Catholic missions, accompanied by troops and establishing ranches, along the southern and central coast of California. These missions were intended to demonstrate the claim of the Spanish Empire to modern-day California. The first quarter of the 19th century continued the slow colonization of the southern and central California coast by Spanish missionaries, ranchers, and soldiers. By 1820, Spanish influence was marked by the chain of missions reaching from Loreto, north to San Diego to just north of today's San Francisco Bay area, and extended inland approximately 25 to 50 miles from the missions. Outside of this zone, perhaps 200,000 to 250,000 Native Americans were continuing to lead traditional lives. The Adams-Onís Treaty, signed in 1819 set the northern boundary of the Spanish claims at the 42nd parallel, effectively creating today's northern boundary between California and Oregon. The founding of Mission San Diego de Alcalá, July 16, 1769. Spain had maintained a number of missions and presidios throughout New Spain since 1493. The Crown laid claim to the north coastal provinces of California since 1542. Excluding Santa Fe in New Mexico, it was slow in settlement for 155 years. Although establishments officially beginning in Loreto, Baja California Sur were established in 1697, It was not until the threat of an incursion by Russia, coming down from Alaska in 1765, that King Charles III of Spain felt development of more northern installations were necessary. By then the Spanish Empire was engaged in the political aftermath of the Seven Years' War and colonial priorities in far away California afforded only a minimal effort. 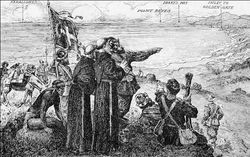 Alta California was to be settled by Franciscan monks, protected by troops in the California Missions. Between 1774 and 1791, the Crown sent forth a number of expeditions to further explore and settle Alta California and the Pacific Northwest. Gaspar de Portolà sights San Francisco Bay, November 4, 1769. 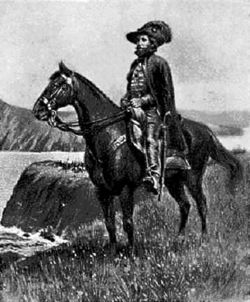 In May 1768, the Spanish Visitor General, José de Gálvez, planned a four-prong expedition to settle Alta California, two by sea and two by land, which Gaspar de Portolà volunteered to command. The Portolà land expedition arrived at the site of present-day San Diego on June 29, 1769, where it established the Presidio of San Diego. Eager to press on to Monterey Bay, de Portolà and his group, consisting of Father Juan Crespi, sixty-three leather-jacket soldiers and a hundred mules, headed north on July 14 moved quickly, reaching the present-day sites of Los Angeles on August 2, Santa Monica on August 3, Santa Barbara on August 19, San Simeon on September 13 and the mouth of the Salinas River on October 1. Although they were looking for Monterey Bay, the group failed to recognize it when they reached it. On October 31, de Portolà's explorers became the first Europeans known to view San Francisco Bay. Ironically, the Manila Galleons had sailed along this coast for almost 200 years by then. The group returned to San Diego in 1770. An engraved portrait of Fr. 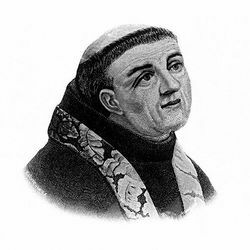 Junípero Serra, O.F.M. The well-known and beloved missionary died in Monterey, California on August 28, 1784. Junípero Serra was a Spanish Franciscan monk who founded the Alta California mission chain. After King Carlos III ordered the Jesuits expelled from "New Spain" on February 3, 1768, Serra was named "Father Presidente." Serra founded Mission San Diego de Alcalá, the first permanent Spanish settlement in Alta California, in 1769. Later that year, Serra, Governor Gaspar de Portolà, and a small group of men moved north, up the Pacific Coast. They reached Monterey in 1770, where Serra founded the second Alta California mission, Mission San Carlos Borromeo de Carmelo. A map depicting New Spain around the turn of the 19th century. The California missions were situated within, and exerted influence over, the area identified in the upper left as "Nueva California," or "New" California. For more information, see: Spanish missions in California. The California Missions are a series of religious outposts established by Spanish Catholic Franciscans to spread the Christian doctrine among the local Native Americans, but with the added benefit of confirming historic Spanish claims to the area. The missions introduced European livestock, fruits, wines, vegetables, and handicrafts into California. Most missions were small, with normally two Franciscans and six to eight soldiers in residence. All of these buildings were built largely with unpaid native labor under Franciscan supervision. In addition to the presidio (royal fort) and pueblo (town), the misión was one of the three major agencies employed by the Spanish crown in an attempt to consolidate its colonial territories. None of these missions were completely self-supporting, requiring continued (albeit modest) financial support. Starting with the onset of the Mexican War of Independence in 1810, this support largely disappeared and the missions and their converts were left on their own. To facilitate overland travel, the mission settlements were situated about 30 miles (48 kilometers) apart, so that they were separated by one day's long ride on horseback along the 600-mile (966-kilometer) long El Camino Real. Freight movement was practical only by ship. Four presidios, strategically placed along the California coast and organized into separate military districts, protected the missions and other Spanish settlements in Upper California. Some of these mission structures survive today while others have been rebuilt, and many have congregations established since the beginning of the 20th century. The highway and missions have become, for many, a romantic symbol of an idyllic and peaceful past. The "Mission Revival Style" was an architectural movement that drew its inspiration from this idealized view of California's past. The Spanish (and later the Mexicans) encouraged settlement with large land grants which were turned into ranchos, where cattle and sheep were raised. Cow hides (at roughly $1 each) and fat (known as tallow, used to make candles as well as soaps) were the primary exports of California before the gold rush. The owners of these ranchos styled themselves after the landed gentry in Spain. A view of Fort Ross (krepost' rus) in 1828. Beginning in the early 1800s, Russian fur trappers explored the West Coast, hunting for sea otter pelts as far south as San Diego. In 1812 the Russian-American Company set up a fortified trading post at Fort Ross. This colony was active until 1841. 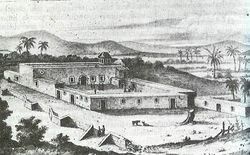 El Presidio de Sonoma ("Sonoma Barracks") was established in 1836 by the Commandante-General of the Northern Frontier of Alta California as a part of Mexico's strategy to block further Russian incursions into the region. A map, or diseño, of Rancho Providencia, a 4,064-acre Mexican land grant now occupied by the City of Burbank. By 1846, California had a Spanish-speaking population of under 10,000, tiny even compared to the sparse population of states in Mexico proper. The "Californios," as they were known, consisted of about 800 families, mostly concentrated on a few large ranchos. About 1,300 Americans and a very mixed group of about 500 Europeans, scattered mostly from Monterey to Sacramento dominated trading as the Californios dominated ranching. In terms of adult males, the two groups were about equal, but the Americans were more recent arrivals. Mexico ordered the secularization of the missions in 1833. The Franciscans soon thereafter abandoned the missions; the mission buildings were plundered, the Indians scattered. American and British fur trappers entered California in search of beaver after 1800. In 1840, the American adventurer, writer and lawyer Richard Henry Dana wrote of his experiences aboard ship off California in the 1830s in Two Years Before the Mast. Although a small number of American traders and trappers had lived in California since the early 1830s, the first organized overland party of American immigrants was the Bidwell-Bartleson party of 1841. With mules and on foot, this pioneering group groped their way across the continent using the still untested California Trail. Also in 1841, an overland exploratory party of the United States Exploring Expedition came down the Siskiyou Trail from the Pacific Northwest. In 1844, Caleb Greenwood guided the first settlers to take wagons over the Sierra Nevada. By 1845, the province had a non-Native American population of about 1500 Californio adult men (with about 6500 women and children), who lived mostly in the southern half. About 2,000 recent immigrants (almost all adult men) lived mostly in the northern half of California. ↑ Before California: An archaeologist looks at our earliest inhabitants  See Map of California Tribes. ↑ The 1936 Drake's Plate of Brass was a hoax. ↑ The French In Early California. Ancestry Magazine. Retrieved on March 24, 2006. This page was last modified 21:38, 18 June 2014.